Outside of the web, the marketing world has an endless list of tools to help us communicate with our audience. Each medium has its own strengths which give them an advantage over others. Many marketing budgets are devoting more and more to the web as it is one of the most effective and efficient forms of marketing in the business world. From ecommerce sales to brand community growth, using the web to achieve marketing and business objectives consistently returns one of the highest ROIs out of the many forms of marketing you can invest in. I obviously sound like a total fan boy for web, and I am! However, I believe that all forms of advertising have a purpose and are important in your marketing mix and achieving company goals. Like a balanced retirement plan, your marketing efforts should be well diversified. For example, a well-placed billboard can be a powerful tool for branding and all marketers love a good old fashioned street team guerilla marketing tactic for a buzz-provoking result. While the traditional marketing examples above can be effective, they make it difficult to quantify the total impact they have on your business. This is an issue we see in many offline marketing campaigns. Metrics is the one area where online marketing leaves other channels in the dust. You can measure online marketing with great detail, and understand what is most effective for your marketing dollar. This is valuable for any business, but can be especially valuable to a small business that doesn’t have an endless marketing budget like a major retail brand. Small businesses need to know how every dollar is working for them. Bridging the Offline – Online Gap. 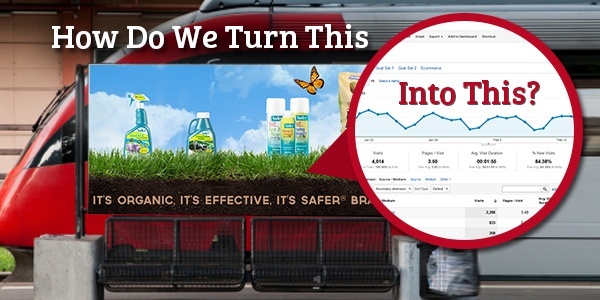 Tracking offline marketing with Google Analytics? This can be easier than you think! It is a concept that can make a huge impact on marketing analysis when it is implemented properly. It is also very much underutilized in the marketing world! Some items can be accomplished on your own, some may need a little web programmer love and others might inevitably involve pulling in an agency since they’ll have tons of experience with the process. However, every business should be able to implement one of these concepts in some form. Tip Number 1: You know that little thing called a phone number? Track it! Call tracking is a great tool for understanding the full impact of your website. Not every lead converts the same way. While many are comfortable with just filling out a web form and waiting for a call, others prefer calling and talking to someone right away. This is especially important for businesses that offer big ticket items. Many services are available that enable businesses to purchase a unique number for a website that can be used for tracking purposes. It is just a “Google query” away. Next, you will need to implement a little coding on the root level of your website. When someone calls this new number, it is forwarded to your normal business number. This usually involves placing a single file with some quick code that runs when a call is made. 3. TEST and TEST AGAIN! Some additional code will need to be implemented and placed on your website’s root which will ping Google Analytics when the forwarded call is processed. This is usually done by creating a virtual page view every time the number is called. A good developer should be able to get this going for you. 5. Set up a goal in Google Analytics to track the virtual page view. Similar to creating a goal to track a visit to a thank you page, you will need to create a goal which tracks the virtual page view that is created when someone makes a call. Done! You are now tracking calls from your website. Are you ready for the game changer? The same exact thing can be done for offline marketing campaigns. So, let’s say a local HVAC contractor buys some ad space in a local newspaper. All they need to do is create a custom phone number for that marketing effort, and everything else can be set up exactly the same. They will now be able to track all the phone calls received from the newspaper advertisement. Let’s say that same HVAC contractor creates a radio advertisement. Again, all they need to do is create a specific number for that radio ad and track the calls. Over time, they will understand what works, what doesn’t work and what is a waste of marketing dollars. The super quick and dirty way to get some visibility is to create a landing page with a simple Custom Vanity URL. So, if our friendly HVAC contractor is promoting air conditioning repair, they may create a page such as www.HVACGuys.com/ac. Keep it short, simple and easy to remember. In the end, you will be able to track visitors to that landing page and get a general idea for the effectiveness of your marketing campaign. 1. Include your custom call tracking phone number on this landing page. Some people will still call you. Visitors from offline sources may be more comfortable picking up the phone. Give that campaign source credit! 2. Include a web contact form on that page. Don’t make them think too much about how to contact you. Limit the form to only the most vital fields. Provide a clear call to action and give them everything they need to contact you on one page. IMPORTANT: This will not be 100% accurate for tracking resulting conversions. These visitors will come in as Direct Visits. If they navigate the website and convert, your original campaign source will not get credit. This approach is to simply enable you to get a little more insight. Some tracking data is better than no tracking data when it comes to offline. So, how do I get better tracking for visitors to my custom landing page? I will give you a “GOOD” and a “BEST” solution. Save and apply the filter. This will only show visitors who hit that landing page when the visited you the website. Now you can see the conversions that resulted from those visits, and how they interacted with the website. This is the best technique to get more visibility for offline marketing in Google Analytics for those who visit your vanity URL. Basically, you want to treat visitors from newspapers, magazines, radio and billboards as a different referral to your website similar to viewing visitors from organic search, Facebook or paid banner advertisements. In order to track these visitors, you will need to add tracking parameters to your URLs. The parameters that are attached to your URL are basically digested by Google Analytics and used to add classification to visitors from your campaigns. Google has a very useful Tracking URL Builder which makes it easy to create these parameters for novice Google Analytics users! 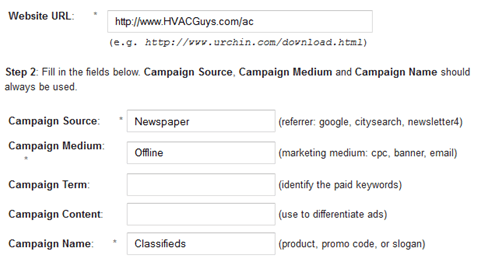 Below is a quick screen shot of the tool using our HVAC contractor’s custom URL. Anyone who visits that URL will be tracked as a Newspaper Source from the Medium “offline” and is from the Classifieds campaign. Your next questions should be “Benn, that URL is ridiculous! No one can remember that. How will I make it work?”. That is when the 301 redirect comes in. 2. Prospect visits www.HVACGuys.com/ac at home. 4. Visitor is tagged as coming from the Offline Newspaper Classifieds Campaign providing you with valuable data. The same concept can be used for other more creative offline promotions. Let’s say you have a street team promoting a new skateboard shop at local skate parks around Philadelphia. The goal is to pass out flyers with a QRcode to skaters. Scanning the QRCode provides a discount offer for the new shop. If someone scans the QR code, you can send them to a redirected URL to track that campaign and understand the end result of your efforts. You may find that your ROI from passing out fliers in skate parks is more effective than your display Adwords campaign. If you track it, you will understand. The major reason why we see some offline channels suffering is not because they are a dated and failing medium. It is because they are not being utilized and tracked in a way that can help marketers understand ROI. I am not speaking for everyone. Obviously these ideas are being used by some businesses, but are they being used by the small businesses around the country that spend lots of hard earned money on advertising without knowing the result? For example, a newspaper makes money by selling ad placements . A small business may stop spending money on that newspaper because they need to make cuts in spending or they hear a lot of chatter about print media dying. Why do people think this? Because lead generation was not tracked, not because the medium has failed. In reality, this could have been a leading traffic driver to that company’s website, but those visits are only being tracked as “Direct”. In the end, both the business and the newspaper suffer. This is a problem. These ideas are actionable and can be implemented without having years of experience using Google Analytics. Before your next offline campaign, take a little extra time and implement one of these ideas. You might be surprised by the results of how well online and offline play together. Have you ever tried using Google Analytics to track offline campaigns? What was your experience and what did you learn?